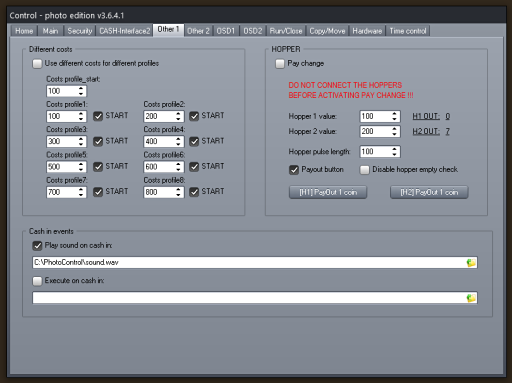 With the photo booth cash control system it is possible to add a cash system to the Breeze DSLR Remote Pro photo booth software (or NKRemote , or Webcam Photobooth , or PSRemote) and charge money for printing photos. The photo booth cash control system package consists of the CONTROL software and a CASH-Interface2 (photo booth edition), plus cables to interface cash devices like coin and bill validator, push buttons and lamps for illumination. 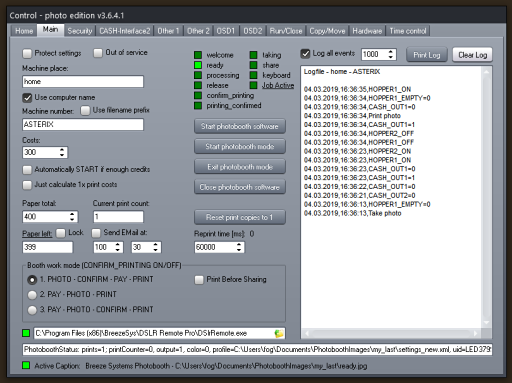 The CONTROL software monitors the CASH-Interface2 and is able to control the photo booth software. By sending keystrokes, the Breeze DSLR Remote Pro photo booth software can be controlled. 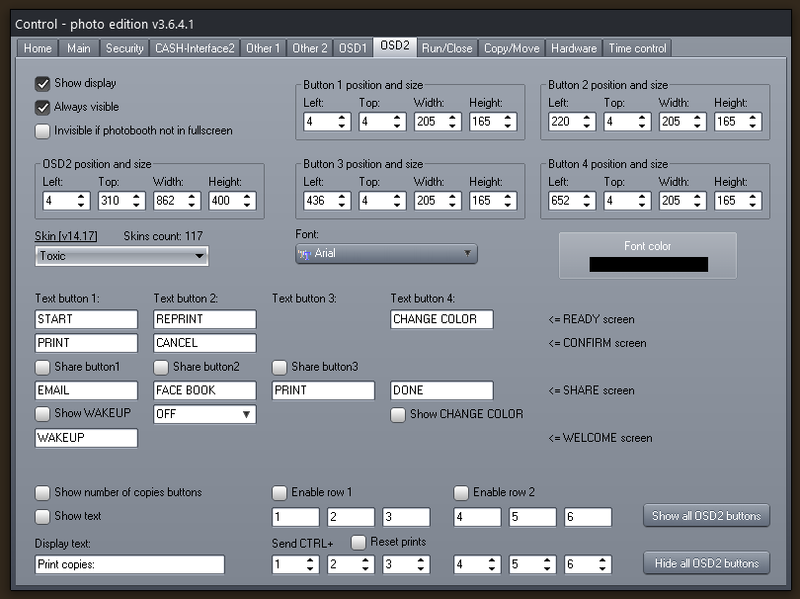 For example, a push button connected to HOPPER1 sends a F4 to the DSLR software and starts a photo session. 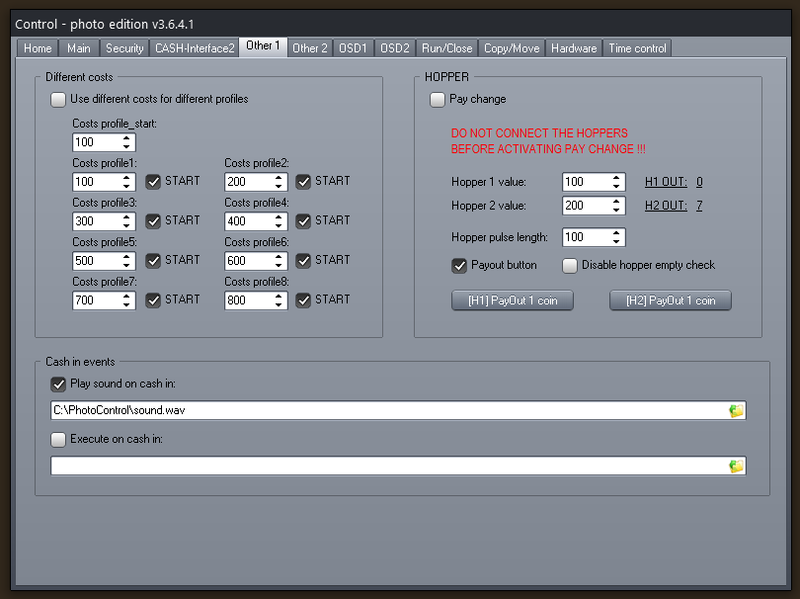 A push button connected to HOPPER2 sends a CTRL+R to the DSLR software and starts a reprint job. It is possible to just use the on screen display (OSD) buttons instead of external push buttons, so external push buttons are not necessary. 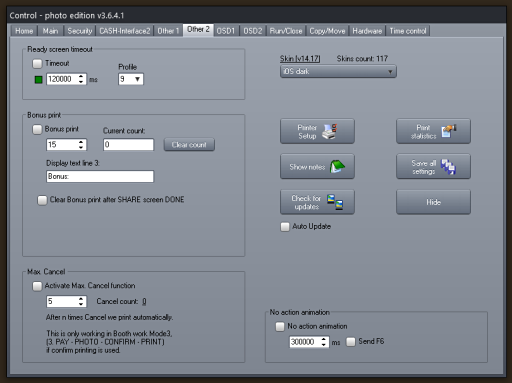 In the CONTROL software itself there can be done several settings. 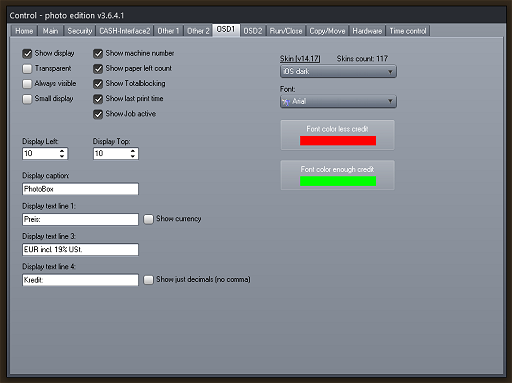 For example set up the coin and bill validator, set the costs for a photo session, activate and set position of the on screen display (OSD1+2), enter machine name and place, activate e-mail the log file, windows security and other settings. While the photo booth machine is in action, the CONTROL software is running invisible in the background. 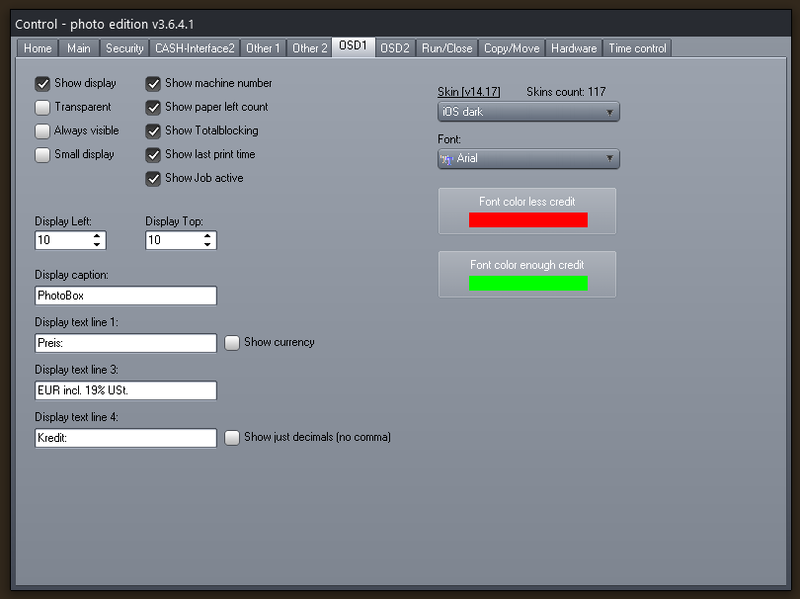 With enough credits the OSD buttons and push buttons at IN1 and IN2 are active. If the DSLR is running in full screen we can detect the state of the DSLR software, e.g. 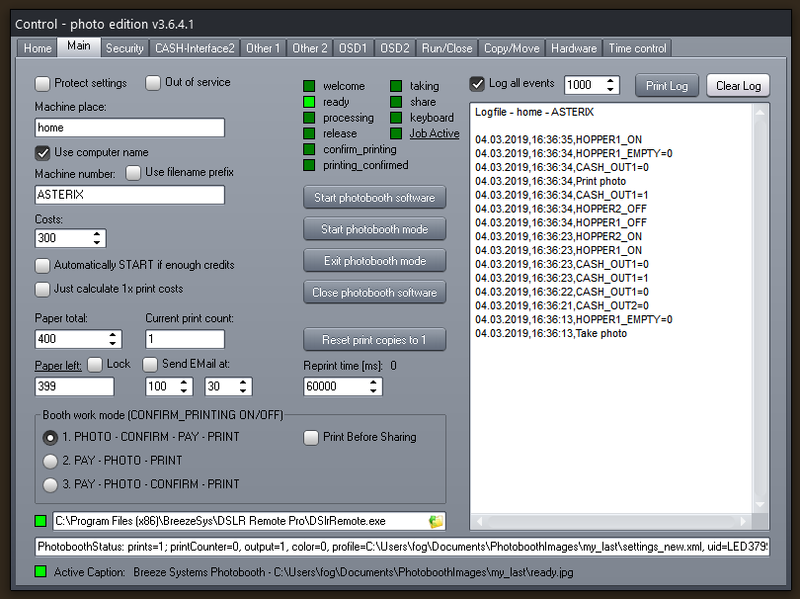 welcome, ready, taking, processing, and so on, and send needed key strokes to the photo booth software. One interesting feature of the payment system is to have different profiles with different costs settings. With the different costs setting there can be different prices for different user profiles. 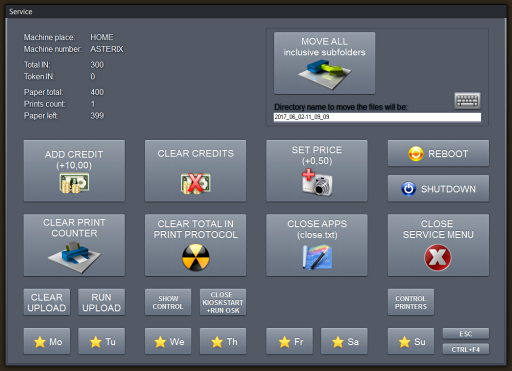 Create a profile_start where user can select different paper size or other things you set up in an own profile. To detect what profile was selected, the profile name on the hard drive must contain the number of the profile, e.g. profile1, profile2, and so on. 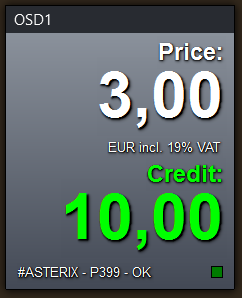 As soon as the user has selected the profile we show the costs for that profile in the OSD1 display. Additionally there is a service menu available, which allows to execute several functions without opening the main control software. Having problems work thru this checklist, this should help to fix your issues! If the COM port is open, the answer from the board with all settings must appear in the log. If not, there is something wrong with the connection to the CASH-Interface2, or simply the wrong COM port setting. Important: Check tight cable connections and the power supply is connected correctly. Using a USB to serial converter the correct COM port number can be found in the Windows device manager, see above video. Check all cables if they fit tight. Remove all extension cables, e.g. USB extension cord or USB hub. Use a different COM or USB plug on the PC, and replace all cables if problems still appear. If the PC main board offers a free PCI Express slot, it is possible to add a cost-effective PCI Express serial card to have a pure COM port available. A COM port can be opened only once, so be sure the COM port is not open by a other application. Be sure the coin validator is placed horizontal so the device can measure correctly. Various currency data sets available. Accepts up to 59 different coins or tokens. Channel 1-6 can be programmed by selfprog mode. Weather-proof design available for outdoor use. More than 60 currencies and multi currency data sets available. Two voltages in one device. +5V DC for operating the CASH-Interface2 board, +12V DC for operating the load.